Her statement provides a useful opportunity to revisit the statistics on the number of Muslims migrating to and living in Australia. The data show the number of Muslims in Australia is growing gradually in line with other non-Christian religions. And the number of migrants from majority Muslim countries remains a small proportion of Australia's overall migrant intake. How big is Australia's Muslim population? Christianity remained the most commonly reported religion in Australia with 61.1% of the population reporting affiliation with a Christian religion - a decline from 63.9% in 2006. 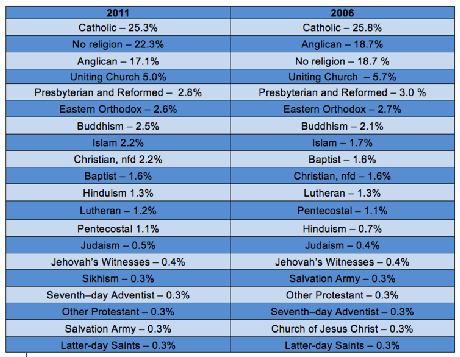 There was an increase in the number of people not reporting a Christian faith from 36.1% of the population in 2006 to 38.9% in 2011. The number of people reporting 'No religion' increased significantly, from 18.7% of the population in 2006 to 22.3% in 2011. The most common non-Christian religions in 2011 were Buddhism (accounting for 2.5% of the population), Islam (2.2%) and Hinduism (1.3%). Of these, Hinduism had experienced the fastest growth since 2006. According to Census data, Islam is growing at a similar rate to that of other non-Christian religions. Given that Australia's immigration policy does not discriminate on the grounds of ethnic origin or religion, it is not surprising to see a rise in non-Christian religions as a proportion of the total population. However, the numbers are still small compared with those identifying as Christian or of no religion. What about migrants from majority Muslim countries? In 2014-15 there were 189,097 places in the skilled and family migration streams of Australia's migration program. United Kingdom (11.1% of migrants in this stream, down from 12.2% in 2013-14). Among the top ten source countries of permanent migrants (excluding New Zealand), in this group, there were two countries with predominantly Muslim populations: Pakistan with 8,281 (4.4%) and Malaysia with 3,977 (2.1%). 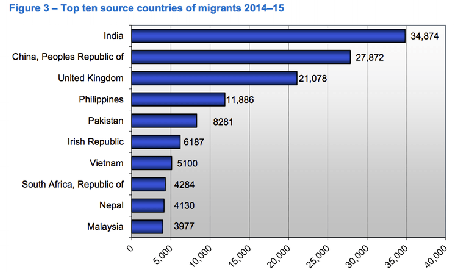 So the number of migrants to Australia from majority Muslim countries was dwarfed by the number of from India 34,874 (18.4%), China 27,872 (14.7%) and the United Kingdom 21,078 (11.1%). The same two Muslim countries were represented in the top ten countries of origin in the figures for permanent migration in 2013-14 in roughly the same proportions. However, Pakistan was not in the top ten for 2012-13. So in recent years, there has been an increase in skilled migration from Pakistan. What about refugees resettled in Australia through its humanitarian program? In the humanitarian program - the program through which refugees are resettled in Australia - there is a greater proportion of migrants from majority Muslim countries. These four majority Muslim countries made up 48.8% of the humanitarian intake. Many of these migrants were fleeing persecution from oppressive regimes in their countries of origin, and were either not Muslims themselves, or rejected a fundamentalist version of Islam. And although there is a greater proportion of migrants from traditionally Muslim countries in the humanitarian program, the humanitarian program made up only 6.7% of the total permanent migrant intake into Australia in 2014-15. 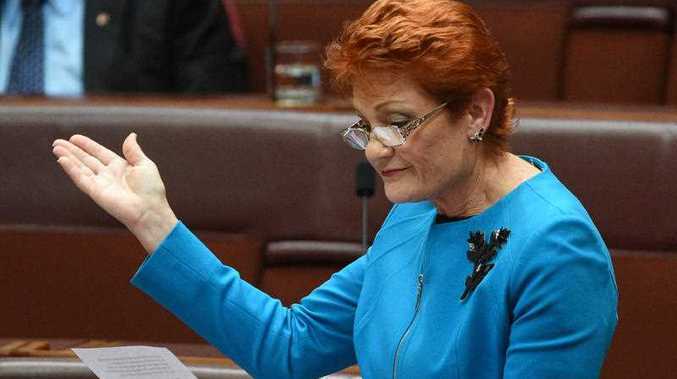 The implication in Hanson's statement is that there is a number of Muslims that would "overwhelm" the Australian people. There is obviously no precise number of people or proportion of the population that can be determined to have achieved a "swamping" of the country. For some, a very small number of Muslims might be sufficient to engender a fear of being swamped. For others, "swamping" is simply an inflammatory term for issues of integration. In terms of integration, Australia does not have a national religion. Australia is culturally associated with a democratic tradition that has Christian origins. People of all religions pledge to uphold Australian values when they join the Australian community. It is subscription to these values which unites us in our diversity. Fear of being overwhelmed is a fear of the unknown. The constitution of Australian society has changed dramatically in the last 40 years. For some people, this has been extremely challenging to their sense of identity. 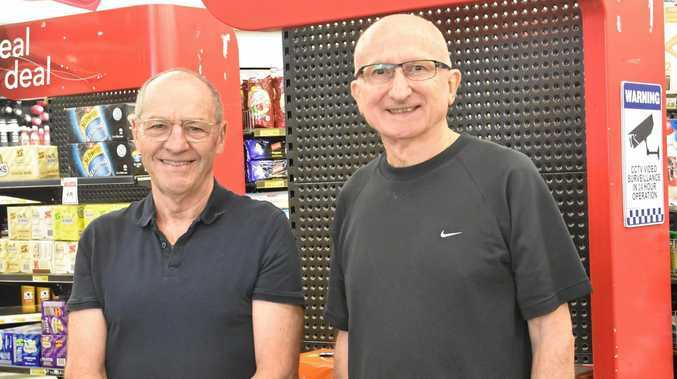 It is important to allay these fears both by painting a clear picture of the way Australian society has transformed and the benefits of this transformation, while addressing fears and tensions that arise along the way. Alex Reilly receives funding from Horticulture Innovation Australia and the Fair Work Ombudsman. Alex is on the management committee of the Refugee Advocacy Service of South Australia.